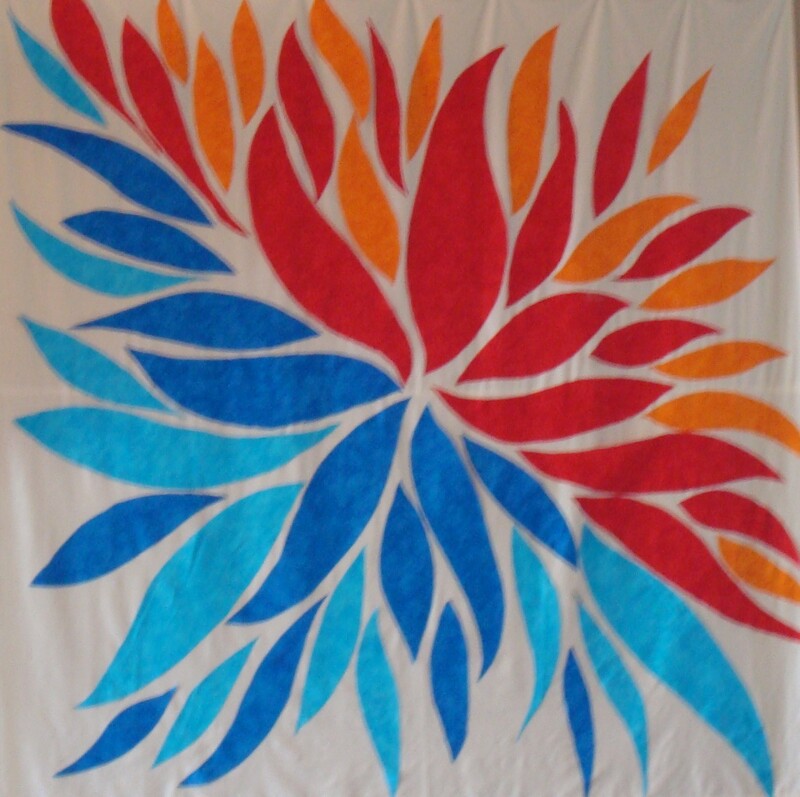 With the blessing of First United Methodist Church, Santa Rosa CA, my home for four years, I created this fabric panel which hung in the sanctuary for Pentecost. So…this is the third iteration in a series of art pieces. It’s only the second piece made for semi public viewing. The first was painted on a paper bag at camp, the second is this fabric panel made for First UMC Santa Rosa, California. Over the years I have been exploring the nature of the Holy Spirit. You can read about this exploration in this 2014 blog post on Pentecost and Pride. I have always been fascinated with its seemingly duel nature. Looking throughout the Hebrew Bible and the Christian scriptures, from the breath hovering over the waters in Genesis through the tongues of flame in Pentecost, in the silence and in the crowd. This new art piece started forming as I wrote that post on the convergence of Pentecost and Pride Week. Well, I found an old canvas left in an alley and decided to go ahead and put paint to canvas. The piece has now become a great meditation piece. And of course, as I began to paint the image started to shift ever so slightly. 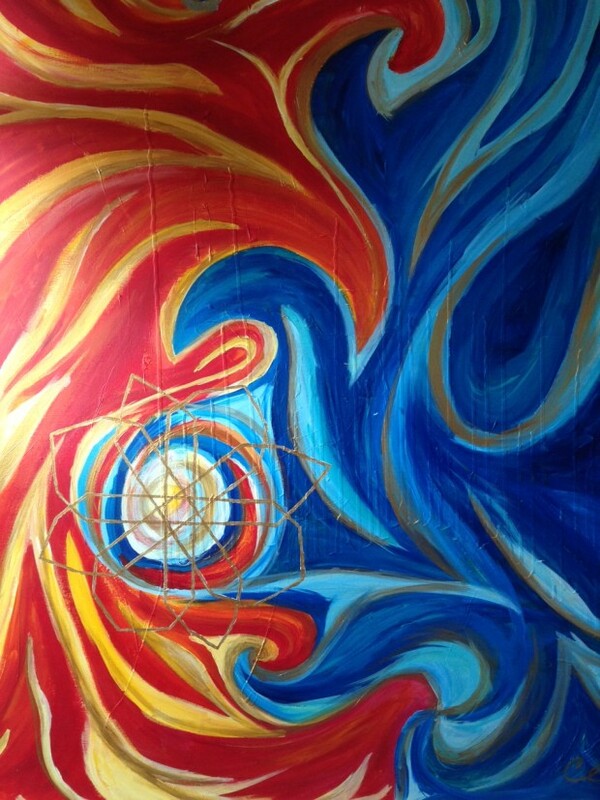 The swirling center is where the soul and the Holy Spirit converge and find fulfillment in each other. And while the colors still show a distinct two natures, the Holy Spirit has only one nature, to move through the world in a single healing force. Sometimes that nature takes on two distinct edges and as Pastor Ginger said in today’s sermon, sometimes making peace means disturbing the false peace we create to hide injustice, to hide pain. It brings a little temporary pain to move us forward into a more complete and peaceful world. The Holy Spirit also catches on the crystal edges of our soul, cut and carved by a million moments of kisses and tears, of love and pain. Each facet was polished and cured to shine brilliantly through the unique design of our human experience. How brilliant each soul, each crystal, each design, each unique and the same, each finite and infinite. 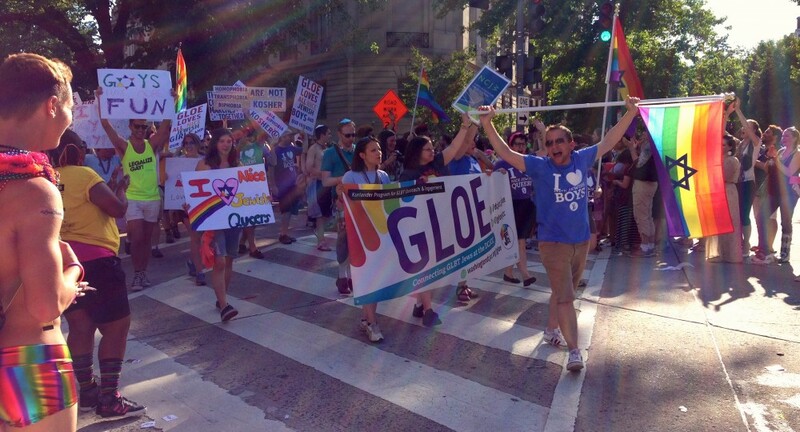 Last week DC celebrated Pride week. Rainbow flags waved throughout the city. On Saturday I attended the Pride parade. ‘Happy Pride day’ was cheered from cars and strangers as we walked on the street. 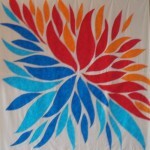 The very next day was Pentecost, one of my favorite holy days. With the rainbow flags hung throughout the streets, I walked into the church and saw the red, orange, and yellow streamers of Pentecost, I was suddenly struck with a new revelation, in my long deepening and shifting understanding of the Holy Spirit. I suddenly saw all the colors of the rainbow in a new way. I was stunned by the idea of God not coming in all the forceful and nearly violent movements, but in the silence. Now you’re asking how this relates to Pentecost. Pentecost is the day the church recognizes as the birth of the church. It is the day the Holy Spirit visited the disciples and touched each with tongues of fire, giving them the gift of language to go out, teach and be understood by all people. Before this moment they had huddled together in an upper room, not knowing what to do after the death and resurrection of Jesus. The story of Elijah and the disciples encounter with the Holy Spirit, combined with my fascination of the mystics of all religions, started me on a life long study of the Holy Spirit. I didn’t realize it would be a life long study. Yet, here I find myself ten years later and still fascinated with how the Holy Spirit manifests in the simple and the profound, in the silence and in the languages of the world. For many years, I had felt pulled between two different yearnings in my spirit. The desire to find quiet contemplation, to dive into myself and God and my desire to be active in the world. For most of my young life I never thought the two could be fulfilled simultaneously. I always pictured myself being pulled apart by these opposing forces of spirit. Then, about 5 years ago, during a drive up the California coast it suddenly occurred to me both these manifestations were coming from the same source of the Holy Spirit, so both were necessary in my life. Both radiated from the same center. From then on I began looking for all the ways the Holy Spirit manifested in both ways, in stories and people. Pentecost focuses on the Spirit’s fire, so when I searched for the opposition of fire I discovered it in the story before Pentecost. If we always start a story at the most dramatic point, we miss the subtle movements occurring and building up to the ‘miracle.’ The disciples could not have been prepared for the ministry to the world had they not been baptized first by Jesus’ love, by the Holy Spirit in cleansing water, washing away preconceptions. and preparing them for the fire of God. The Holy Spirit was calling them out into the world from their upper room, like Elijah being called from his cave. Growing up in California I should have seen this coming. Fire can also be an incredibly cleansing force, and frequently healing comes in finally acting, as in when you finally say how you feel, or tell your story. Similarly, the cooling wash of love, can actually ignite so much energy. I discovered the fire and water of God could be working simultaneously and in partnership, both healing, both igniting. This realization also ironically clarified my study and work with religiously motivated nonviolence. Nonviolence is the ultimate healing action, out of love we speak, we act, we work to bring revelation and justice. Nonviolent actors, have sought to heal themselves by standing up to injustice, and sought to heal the very people who impose, or act in unjust ways, in order to liberate all the people. The way they act is meant to heal the other and themselves. While we still have ignorance in the world, the rainbow reveals for a moment the intersection of light and water helping us see all the beautiful ways our world, our languages, our identities, and our sexualities are manifest.